I’ve written before that Obama’s Solyndra-style handouts have been a grotesque waste of tax dollars. I’ve argued that they destroy jobs rather than create jobs. I’ve gone on TV to explain why government intervention in energy creates a cesspool of cronyism. I’ve even shared a column from Obama’s hometown newspaper that criticizes the rank corruption in green-energy programs. And it goes without saying that I’ve disseminated some good cartoons on the issue. But even though green-energy programs are a disgusting boondoggle, American taxpayers and consumers should be thankful they’re not in Germany. Our programs may be wasteful and corrupt, but we’re amateurs compared to what’s happening on the other side of the Atlantic. Here are some passages from a must-read story in Der Spiegel. The government predicts that the renewable energy surcharge added to every consumer’s electricity bill will increase from 5.3 cents today to between 6.2 and 6.5 cents per kilowatt hour — a 20-percent price hike. German consumers already pay the highest electricity prices in Europe. But because the government is failing to get the costs of its new energy policy under control, rising prices are already on the horizon. Electricity is becoming a luxury good in Germany. As is so often the case with government intervention, the promises from politicians about low costs were a mirage. Perhaps the most shocking part of the story is that Germans are being forced to pay $26 billion in subsidies to get less than $4 billion of green energy. For society as a whole, the costs have reached levels comparable only to the euro-zone bailouts. This year, German consumers will be forced to pay €20 billion ($26 billion) for electricity from solar, wind and biogas plants — electricity with a market price of just over €3 billion. Even the figure of €20 billion is disputable if you include all the unintended costs and collateral damage associated with the project. …On Thursday, a government-sanctioned commission plans to submit a special report called “Competition in Times of the Energy Transition.” The report is sharply critical, arguing that Germany’s current system actually rewards the most inefficient plants, doesn’t contribute to protecting the climate, jeopardizes the energy supply and puts the poor at a disadvantage. Here’s what it means for ordinary people. Not surprisingly, politically well-connected interest groups are the ones reaping the benefits. …the renewable energy subsidies redistribute money from the poor to the more affluent, like when someone living in small rental apartment subsidizes a homeowner’s roof-mounted solar panels through his electricity bill. The SPD, which sees itself as the party of the working class, long ignored this regressive aspect of the system. The Greens, the party of higher earners, continue to do so. Germany’s renewable energy policy is particularly unfair with respect to the economy. About 2,300 businesses have managed to largely exempt themselves from the green energy surcharge by claiming, often with little justification, that they face tough international competition. Companies with less lobbying power, however, are required to pay the surcharge. Let’s conclude with an ominous excerpt from the article. Even though prices already are very high, energy will get even more expensive in the future. If the government sticks to its plans, the price of electricity will literally explode in the coming years. According to a current study for the federal government, electricity will cost up to 40 cents a kilowatt-hour by 2020, a 40-percent increase over today’s prices. And isn’t it nice to know that Obama is doing everything he can to impose these policies in the United States? This cartoon from Michael Ramirez is a perfect summary of Obama’s policy. You can see why Ramirez won my political cartoonist contest. P.S. I don’t like being the bearer of bad news, but green-energy subsidies are just one part of the statist/green agenda. The IMF, for instance, has recommended a huge carbon tax (about $5,500 per year for a family of four!) for the United States. A few gullible folks think this might not be a bad idea if the money gets used to lower other taxes, but they’re the same people who get suckered into buying oceanfront property in Kansas. P.P.S. Germany may be more responsible (less irresponsible) than certain other European nations, but the country’s political elite is hopelessly statist. Even the supposedly pro-liberty political party tilts left and wants bigger government. Yet the Washington Post still thought it was appropriate and accurate to declare that Germany is “fiscally conservative.” Sure, and I’m a socialist. P.P.P.S. But at least the mess in Europe has generated some amusing videos (here, here, and here), as well as a very funny set of maps. Germans pay 34 cents per kilowatt hour for electricity, as opposed to 10-14c in most of the US. Danes pay 40c so the suppression of energy prosperity must be even stronger there. It’s not only how much money you make (and Americans already make more) it is also what you can do with it. 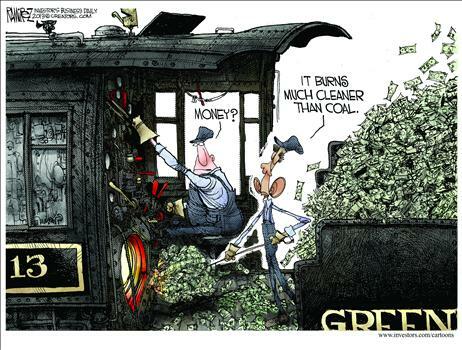 Money that buys you little — because what you are buying is carbon taxed and green energy subsidized — is devalued money. in essence, your work compensation is de facto devalued at the back end. But the biggest left-green euro-change coming to America is even more life changing: Centrally planned societally driven Apartment living. Nicely stacked boxes, of 1000-1200 square feet per family. Green is the new incarnation of red. It is now the main vector for worldwide collectivism, and I hope you understand the implications. Voter moths always attracted to the light. But it’s a CFL this time. PS. Spiegel is one of the most statist publications, constantly calling for more European homogenization and centralization of power in Brussels. But even they are starting to figure out the energy swindle. It has become too obvious to hide, so many forces will try to make the taxes of subsidization less obvious. PPS. When Spiegel talks about energy rising to 40c/kWh, I suspect they are talking about euro-cents. That would be 53 US cents. Try turning on your air-conditioning at that price. PPPS. Naive Americans you ain’t seen anything yet. Germany are also completely replacing their zero-emissions nuclear power plants with COAL! Yup, the greens have convinced the country that although coal-fired electricity plants emit enormous amounts of Co2, it’s non polluting in the long run!